Left Picture: Coleman Hawkins in relaxed mood. Fifty years ago a young version of Jamie Evans made his way to Ronnie Scott’s club in Soho to hear one of the great figures of jazz, Coleman Hawkins. I made my first visit to Ronnie Scott’s club in 1967. I was working on the tabloid newspaper, The Daily Sketch, now in the dustbin of history. Doing evenings and nights effectively stopped me playing or listening to live jazz very much. However hearing that the legendary tenor sax man Coleman Hawkins was appearing at the Old Place in what is now Chinatown made it an unmissable occasion. By the time the ‘60s rolled in, the “founding fathers” of jazz had been overshadowed by the bebop revolution. 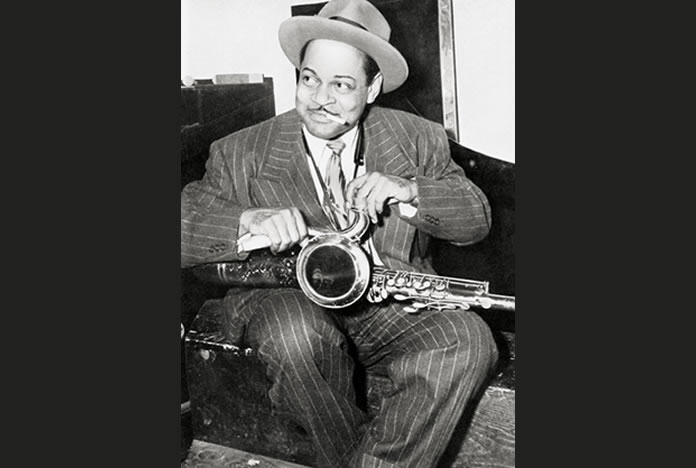 Musicians like Coleman Hawkins, Lester Young, Ben Webster, and a host of others, were considered “Old Hat’ by many. Even so, a body of younger fans (including yours truly) refused to forget the artistry of these early giants. In 1967, I was 25-years-old and the Hawk was one of my special heroes. He almost single-handedly created the tenor saxophone as a serious solo voice in jazz and contributed massively to the development of up-and-coming players. His attitude to the Young Turks was generous to a fault. While many of the Hawk’s contemporaries were sceptical of the bebop boys’ “Chinese music”, he unfailingly employed up-and-coming modernist musicians in his outfits and provided work and outlets for them to be heard. Returning to 1967, Ronnie Scott’s had been opened for less than a decade and, unlike the internationally renowned, slick and sophisticated venue it is now, was little more than a cellar for dedicated modern jazz lovers. Nevertheless, Ronnie and partner Pete King still managed to attract some top US performers like Zoot Sims, Johnny Griffin, Lee Konitz, Sonny Rollins and Sonny Stitt. Above Picture: The Hawk was always encouraging to young musicians. On the night covered here when the Hawk was the main attraction, the house rhythm section was Stan Tracey (piano), Alan Ganley (drums) and I don’t recall the bass player. Can I say at this point that I never kept a diary, so much of this piece is written from memory. I have checked as many dates and facts as possible but sticklers for absolute accuracy will have to forgive any glaring lapses. In due course, the Hawk took the stand. He was a frail-looking man of 62 although to be brutally honest he looked at least 10 years older, with his halo of white hair and stooped posture. He played beautifully. Much of his early power and bounce had gone but he made up for that with his soft and considered phrasing and clever dynamics. In many of our lives comes a moment which we never forget and even when we are in our autumnal years, as I am now, look back in awe at a fantastic experience. The rhythm section left the stand and the old man went into an unaccompanied solo of September Song. It’s an old cliche but I think I can say that the collective hairs on the necks of everyone in the room tingled with pleasure at the sheer poetry of the Hawk’s interpretation. And so 50 years on, I am recalling that unforgettable night when a saxophone master demonstrated his art on Kurt Weill’s beautiful song. Sadly, two years later Coleman Hawkins died at the age of 64. Official cause of death was liver disease almost certainly brought about by those historic jazz spectres of alcohol and malnutrition. But, as the comedian Max Miller used to say in a different context, “there’ll never be another”. This was the nearest I could find to the sound I heard that night, recorded in 1967 in Germany with the Oscar Peterson Trio joining him at the end.